Uglich (Russian: Углич, IPA: [ˈuɡlʲɪtɕ]) is a historic town in Yaroslavl Oblast, Russia, which stands on the Volga River. Population: 34,507 (2010 Census); 38,260 (2002 Census); 39,975 (1989 Census). A local tradition dates the town's origins to 937. It was first documented in 1148 as Ugliche Pole (Corner Field). The town's name is thought to allude to the nearby turn in the Volga River. Uglich had been the seat of a small princedom from 1218 until 1328 when the local princes sold their rights to the great prince of Moscow. As a border town of the Grand Duchy of Moscow, it was burned several times by Lithuanians, Tatars, and the grand prince of Tver. Grand Duke Ivan III of Moscow gave the town to his younger brother Andrey Bolshoy in 1462. During Andrey's reign, the town was expanded and first stone buildings were constructed. Particularly notable were the cathedral (rebuilt in 1713), the Intercession Monastery (destroyed by the Bolsheviks) and the red-brick palace of the prince (completed in 1481 and still standing). During the reign of Ivan the Terrible, the town passed to his only brother, Yury. Local inhabitants helped the Tsar capture Kazan by building a wooden fortress which was transported by the Volga all the way to Kazan. Throughout the 16th century, Uglich prospered both politically and economically, but thereafter its fortunes began to decline. After Ivan's death, his youngest son Dmitry Ivanovich was banished to Uglich in 1584. The most famous event in the town's history took place on May 15, 1591 when the 10-year-old boy was found dead with his throat cut in the palace courtyard. Suspicion immediately fell on the tsar's chief advisor, Boris Godunov. Official investigators concluded however that Dimitriy's death was an accident. They cut a "tongue" from the cathedral bell that rung the news of Dimitriy's death and "exiled" it to Siberia. As Dimitry was the last scion of the ancient Rurik Dynasty, his death precipitated the dynastic and political crisis known as the Time of Troubles. People readily believed that Dmitry was alive and supported several False Dmitrys (see False Dmitry I, False Dmitry II, False Dmitry III) who tried to grab the Muscovite throne. During the Time of Troubles, the Poles besieged the Alexeievsky and Uleima monasteries and burned them down killing all the populace who had sought refuge inside. The Romanov Tsars made it their priority to canonize the martyred Tsesarevich and to turn Uglich into a place of pilgrimage. On the spot where Dimitry had been murdered the city in 1690 built a small Church of St. Demetrios on the Blood, which appears on the horizon with its red walls and blue domes as one sails north on the Volga. The palace where the prince lived was turned into a museum. The image of Tsesarevich with a knife in his hand was adopted as the town's coat of arms. In the first third of the 18th century the kremlin cathedral and its remarkable bell-tower were demolished and rebuilt. Other 18th-century landmarks include the Smolenskaya, Korsunskaya, Kazanskaya and Bogoyavlenskaya churches. The most important edifice of the 19th century is the ponderous cathedral of the Theophany Convent, consecrated in 1853. The modern town did have a famous watch manufacturing plant now closed (see Chaika watches), a railway station, and a hydroelectric power station. In November 2008 was opened a new Nexans cable mill. Actually, Stalin's decision to create the Uglich Reservoir led to severe flooding of the town's outskirts. Within the framework of administrative divisions, Uglich serves as the administrative center of Uglichsky District, even though it is not a part of it. 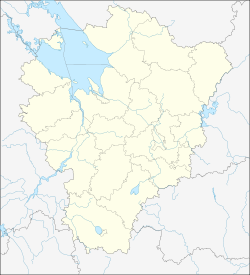 As an administrative division, it is incorporated separately as the town of oblast significance of Uglich—an administrative unit with the status equal to that of the districts. As a municipal division, the town of oblast significance of Uglich is incorporated within Uglichsky Municipal District as Uglich Urban Settlement. Apart from the kremlin, the city center features other nice samples of old Russian architecture. Particularly notable are the Alexeievsky and Resurrection monasteries. The Assumption three-tented church (1628) of the Alexeyevsky Monastery is considered a true gem of Russian medieval architecture. "Marvelous" is an epithet that common people gave to their church and which became a part of its official name. Located nearby is the more conventional Church of St. John the Baptist (1681). More old architecture may be seen in the vicinity of Uglich, including the 17th-century Uleima Monastery and a fine church in Divnogorye. ^ Kennan, George (1891). Siberia and the Exile System. London: James R. Osgood, McIlvaine & Co. pp. 420–422, 427. Государственная Дума Ярославской области. Закон №12-з от 7 февраля 2002 г «Об административно-территориальном устройстве Ярославской области и порядке его изменения», в ред. Закона №67-з от 21 декабря 2012 г. «О внесении изменений в отдельные законодательные акты Ярославской области и признании утратившими силу отдельных законодательных актов (положений законодательных актов) Ярославской области». Вступил в силу через шесть месяцев со дня официального опубликования. Опубликован: "Губернские вести", №11, 15 февраля 2002 г. (State Duma of Yaroslavl Oblast. Law #12-z of February 7, 2002 On the Administrative-Territorial Structure of Yaroslavl Oblast and on the Procedures of Its Change, as amended by the Law #67-z of December 21, 2012 On Amending Various Legislative Acts of Yaroslavl Oblast and on Abrogation of Various Legislative Acts (Clauses of Legislative Acts) of Yaroslavl Oblast. Effective as of the day six months from the day of the official publication.). Государственная Дума Ярославской области. Закон №65-з от 21 декабря 2004 г. «О наименованиях, границах и статусе муниципальных образований Ярославской области», в ред. Закона №59-з от 28 декабря 2011 г «Об изменении статуса рабочего посёлка Песочное Рыбинского района и о внесении изменений в отдельные законодательные акты Ярославской области». Вступил в силу через 10 дней со дня официального опубликования. Опубликован: "Губернские вести", №70, 23 декабря 2004 г. (State Duma of Yaroslavl Oblast. Law #65-z of December 21, 2004 On the Names, Borders, and Status of the Municipal Formations of Yaroslavl Oblast, as amended by the Law #59-z of December 28, 2011 On Changing the Status of the Work Settlement of Pesochnoye of Rybinsky District and on Amending Various Legislative Acts of Yaroslavl Oblast. Effective as of after 10 days from the day of the official publication.). Wikivoyage has a travel guide for Uglich. Chisholm, Hugh, ed. (1911). "Uglich" . Encyclopædia Britannica (11th ed.). Cambridge University Press.